How do you achieve results in Washington? The best answer: don't use a boilerplate Beltway strategy. How do you achieve results in Washington? The best answer: don't use a boilerplate Beltway strategy. Bolster your outreach to senators and representatives with PR targeted to their bases back home. Seek media hits that leap from one medium to another. And build coalitions across ideological lines. In short: Go local. Go viral. Go left and right. That bipartisan - and barrier-breaking - strategy used to be a novelty. It has now become a necessity. The media marketplace and political process are changing at warp speed. Yesterday's outliers are today's powerbrokers. In February 2007, a first-term senator announced his presidential bid. In February 2009, a cable commentator called for Tea Party protests. Now that insurgent candidate is president and that insurgent movement is changing the Republican Party every day. The 2010 elections transformed power relationships within, as well as between, the parties. Party labels no longer tell you how lawmakers will vote on tax cuts or trade agreements because each party includes insurgents and establishmentarians. There are bitter battles. But it's not trench warfare with disciplined armies firing from fixed positions. Prepare for unconventional warfare, with shifting alliances and flexible, fast-moving tactics. Go local. Localize issues in terms of business impact. Meet editorial boards. Urge locally prominent people to write op-eds in the home states and districts of influential politicians. Place friendly community leaders on local TV, radio, and talk shows. Go viral. Whether dealing with "new" or "old" media, ask if they influence potential participants in the debate and decision-makers who determine outcomes. Seize opportunities to leap from medium to medium: compelling op-eds are picked up by bloggers and generate cable news appearances. Videos go viral on social media. Go left/right. People on either side of the aisle can end up on the same side of an issue for very different reasons. If you're opposing a federal policy, build a coalition among insurgent officeholders and groups of opposing philosophies. Some may be skeptical of government intruding in the private sector. Others may oppose the policy because they feel it favors one interest. Together, they give you a winning right/left alliance. Integrated, innovative plans are key to scoring goals in public policy today. As hockey great Wayne Gretzky said, "Skate to where the puck is going, not where it is." 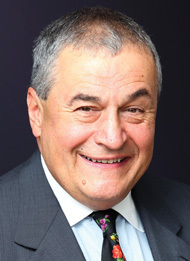 Tony Podesta is chairman of the Podesta Group.